Henry Esmond’s first Vision of the radiant Beatrix descending the staircase in the home of the Castlewoods. I felt then as if a new planet had swum into my ken, like Keats opening Chapman’s Homer. I had the same feeling when my father bought the walking-stick, the first I ever had. It held a promise of a world which contained such marvels as the glitteringly white and elegant Spa; the fascinating display of all that Yorkshire held to be high fashion every Sunday morning in what was known in those days as the Church Parade, when the rich visitors to Scarborough slowly walked down the hill from church in their finest attire, whilst we lined up on the pavement to gape at them in wonder and envy; the daily concerts held on the Spa conducted by the flamboyant Alastair Maclean, who, in his cloak and wide-brimmed hat, rather resembled the Toulouse-Lautrec posters of Aristide Bruant, but who was not, if he encountered my wheel-chair in the streets of Scarborough, above gravely saluting me; and best of all there were Catlin’s Royal Pierrots on the south foreshore. What young Gibson had begun, Catlin’s Royal Pierrots continued, especially one of its members called McAllister. It was said that Mr Catlin, who himself appeared with the company, and despite advancing middle age did a sensational somersault at every performance, had begun his entertainment career on the sands in a fit-up booth, but when I knew his magical organization he had his own splendid theatre. This was quite an inspiration to me. It told me what opportunities were open to talent, and it occurred to me even in that early part of my life that if Mr Catlin had been able to force the door of success in his most improbable ascension, I might be able to do something of the sort myself. Not for nothing was I the nephew of Jabez, Frank, and Tom. The Catlin shows were, in the first half of the programme, played in pierrot costume: peaked hat and pom-poms. It was this that brought me to the height of ecstasy, for I did not like the second half, in which the men wore dinner jackets and the ladies long evening dresses, anything like so much. All the players were delightful; they could, it seemed to me, sing and dance with miraculous skill, but one of them, the McAllister (I think his Christian name was Andrew) whom I have already mentioned, particularly entranced me. I was already convinced that Martin-Harvey was the greatest of actors, but after all I had only seen his genius in the pale reflections of the amiable Gibson, whilst McAllister was there on the stage, alive, Vital, amusing and overwhelmingly pathetic. Vesta Tilley and Little Tich were far more famous than he, for they were London stars, and McAllister was only a seaside entertainer, but he was the first actor I ever saw who could bring a lump to the throats of the audience, and send that shiver down the spine which many years later A.E. Housman said was the only sign by which he recognized that he was in the presence of great poetry. McAllister was, however, funny as well as sad. He did two turns, in the first of which he told Scottish stories that doubled me up with laughter. Long afterwards, also in Scarborough, I heard the great Harry Lauder. In comparison with McAllister I found him smug and patronizing, conscious of an eminence which it seemed to me nothing in his performance justified. But McAllister would also do another turn, this time in the King’s English. This was a very serious turn, and it was to me the very summit of McAllister’s achievement. He would work us up into a tremendous passion and excitement with a monologue like ‘The Green Eye of the Little Yellow God’, though this was probably somewhat later in his career than my first visit to Scarborough. On that visit he recited ‘His First Long Trousers’. It evoked the ending of childhood, the finish of innocence, the moment when the father ceases to be his son’s protector, and the son takes his first timid and uncertain steps in the world on his own. It was wondrously sentimental, and those who themselves have no capacity for touching the feelings of an audience may well despise it. In this I cannot but consider them unwise. It is foolish to scoff at a kind of theatre for which you have no talent. The simple fact is that when McAllister recited ‘His First Long Trousers’ not only did tears pour down my face, but I understood better both the danger and the excitement of life. There was something else about McAllister that profoundly moved me and deeply influenced me when I became a drama critic: he was not only a powerful artist but he was also a delicate one. He used to deliver his comedy talk wearing his peaked hat, but he recited his serious pieces bareheaded. His taking off his hat and his removal of the black skull cap underneath it was the first piece of imaginative ritual I ever encountered. I was stirred by this simple gesture of respect for the seriousness and reverence of life: the moment when he doffed his cap was always to me one of the high points of his performance. When in Godspell at Wyndham’s Theatre the clowns did exactly this before representing the Crucifixion, all the emotion I had felt when watching McAllister rushed back upon me. This particular scene (there have been others in other plays) is one of those which my feelings will never allow me to describe in level tones. When I think of it my voice always breaks. McAllister, without knowing it, taught me to appreciate Godspell. That, I think, would not have surprised him. He might have been somewhat more taken aback had he known that it was partly his use of ritual that enabled me to understand Genet. The knowledge might, in fact, have made him sad. Comments: Harold Hobson (1904-1992) was a renowned British theatre critic, whose childhood was spent in Scarborough. 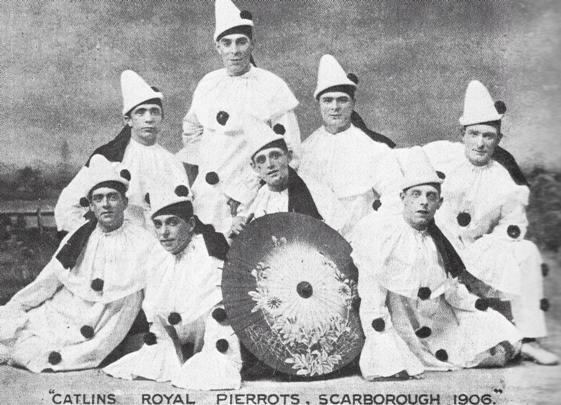 Catlin’s Royal Pierrots, led by Will Catlin (real name William Fox) appeared at venues throughout the UK in the late 19th/early 20th century. He became associated in particular with Scarborough, opening the Catlin’s Arcadia venue in the town in 1909. A. ‘Mac’ McAllister was a member of the all-male troupe. The religious rock musical Godspell opened in London in 1971.